"Though it doesn’t officially go on sale in the UK until 2009, the first examples of Nissan’s 473bhp GT-R are already arriving here through unofficial channels. Renowned Japanese importer Ian Litchfield is among the earliest to get hold of one; it’s the black one in our picture. And after he offered our own Chris Harris a go in it only last week, Autocar can bring you the first driving impression of the car ever produced in the UK." 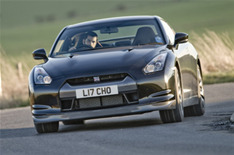 "Come back to Autocar.co.uk on February 20 to watch exclusive video from our UK GT-R drive"
Now there are at least a couple of R35 GT-Rs in the UK. I still wonder when the first cars will show up in the US.